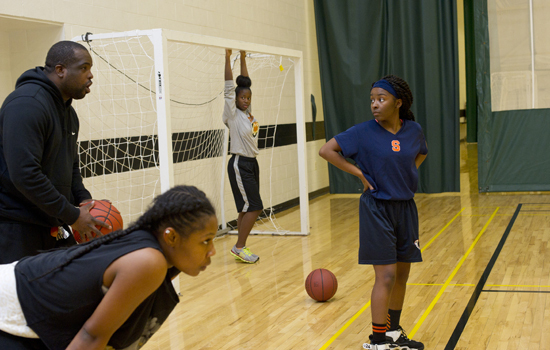 Tenth grader Justice Marbury, right, during a JV basketball practice session at RIT’s Gordon Field House. Rochester Prep High School (RPHS) ninth and 10th grade students don’t seem to mind getting up in the predawn hours, donning uniforms and catching the bus for the long school day that runs from 8 a.m. to 4:10 p.m. And they simply shrug at the mention of an extended 190-day instructional year that begins in late August and finishes at the end of June. Real city kids, real learning gains and real advantages are strong indicators of RIT’s commitment to urban education at its partner charter school at 175 Martin St. Since opening its doors to 40 freshmen in fall 2014, RPHS, run by Uncommon Schools, is on a four-year growth spurt to encompass nearly 500 students in grades nine-12 by 2018. Serving mainly low-income families, the majority of which are black and Hispanic, the school operates independently from the Rochester City School District and is publicly funded so students do not pay tuition. “RIT’s partnership with Uncommon Schools is a unique collaboration between our university and Rochester city students currently in the charter school system,” said Kit Mayberry, RIT vice president for strategic planning and special initiatives. The university’s alliance with Uncommon Schools was made possible by a donation from RIT trustee Ronald L. Zarrella, former chairman and CEO of Bausch & Lomb, who is funding RIT’s contributions to the partnership. During the past two years, RIT has taken an active role in providing faculty, student tutors, advisement on curricula, and exposure to courses and careers in STEM fields of science, technology, engineering and math. 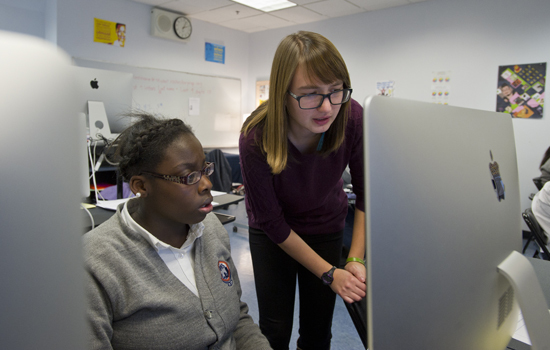 Helping them manage classroom activities are CIAS undergraduates—including Rachel Dominic, a third-year advertising photography major from Baldwinsville, N.Y.
Nastav said Uncommon Schools’ growth model, adding a new class to the high school each year, has worked well. Under the helm of Principal David McBride and Director of Operations Laura Wilkinson, RPHS is results-driven—with a focus on professional development for teachers and a meticulous use of data to track student achievement and target resources when needed. The staff fully recognizes they are there to educate the hardest-to-educate kids, who are statistically behind. The bigger place, of course, is having opportunities to navigate the RIT campus and visit classrooms, labs, dining halls and sports facilities. Tenth-grader Justice Marbury is on the RPHS-JV basketball team and uses the Gordon Field House as an after-school practice site several times a week. She also participated in a special photojournalism project led by RIT Professor William Snyder ’81 (photography), photojournalism program chair in the School of Photographic Arts and Sciences. As Anna Hall, chief operating officer of Uncommon Schools, said, “The question always is, are we doing the right thing in order to change the trajectory of Rochester Prep students and education in Rochester? Rachel Dominic, right, with Areiona Moultrie, is one of the RIT undergraduate classroom mentors from the College of Imaging Arts and Sciences.